18.8.2018 It’s all true. – Detective? – It’s all true. 18.8.2018 You can’t outrun what you’ve done. What you truly are. Chloe Decker: I believed everything you said, Marcus. That you loved me. That you did all of this for me. Which is why I know that you won't shoot. Marcus Pierce: Finish it. Finish it! 18.8.2018 You made me realize that life is worth living. Ella Lopez: I miss Charlotte. Lucifer Morningstar: So do I, Ms. Lopez. Ella Lopez: I can't believe she's really gone. And that Pierce would do what he did. I know, God works in mysterious ways, and bad things happen for a reason. But this many bad things, I just... I'm having a hard time finding any reason. Why would He do all this? Lucifer Morningstar: Well, I can't believe I'm saying this, but I don't actually think it's my Father's fault. See, all this time I thought it was Him pulling the strings. I've started to realize that we are the responsible parties. It's quite devious of Him, if you think about it. We've no one to blame but ourselves. Ella Lopez: Screw that. I blame Pierce. And, Big Guy? You and I are on rocky ground. 18.8.2018 Big Guy? You and I are on rocky ground. Linda Martin: Maze, you need to rest. Mazikeen: No, I can't stay here. Pierce is right. Being on Earth... around all these humans... all these emotions, makes me weak. Linda Martin: You look like you fought ten people and ran a mile to get here. Mazikeen: 12 people. Four miles. Linda Martin: My point is... you did that... for me. To save me. Emotions... emotions are hard. But that's why they make you strong. And this is... This is the strongest I've ever seen you. Linda Martin: You don't have to say anything. Your actions speak plenty. Mazikeen: That's the thing. Actions are easy for me. That's why I need to say it. I'm sorry. Linda Martin: Me, too. (they hug) But I got to ask. Is somebody really trying to kill me? Mazikeen: Don't worry. You're safe. Everything's gonna be fine. 18.8.2018 Emotions are hard. But that’s why they make you strong. Chloe Decker: This cannot be true. Can it? I mean... if you knew this, why wouldn't you say something? I mean, I almost married him. I mean, I almost married him. Lucifer Morningstar: I tried to tell you, but you wouldn't listen. Chloe Decker: No, you said he's immortal, and that is something completely different. Lucifer Morningstar: Is it? If I'd told you he was The Sinnerman as well, would you have believed me? Chloe Decker: I don't know, maybe! Maybe, because that's something that actually exists, and not some metaphor that you've made up. 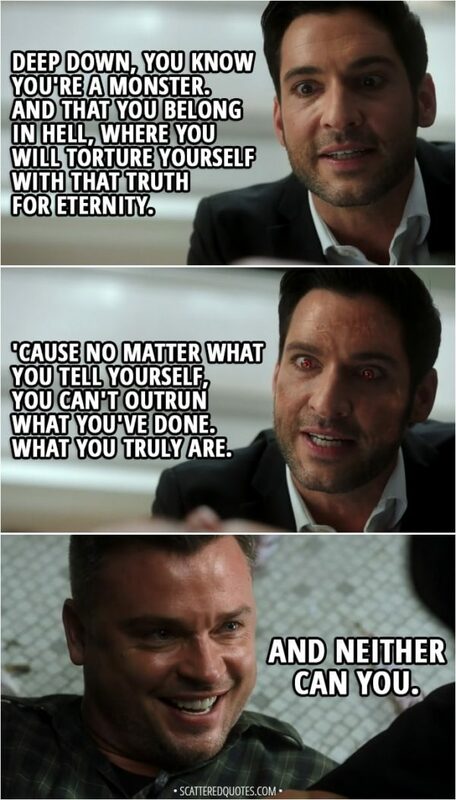 Lucifer Morningstar: I haven't made up anything, Detective, I always tell you the truth, no matter what. 18.8.2018 Detective, I always tell you the truth, no matter what. 18.8.2018 Why did you jump in front of me like that? 18.8.2018 Chloe… I am the Devil. – No, you’re not. Not to me. Chloe Decker: I couldn't sleep last night, so I stayed up all night working, and, you know, I drank a lot of caffeine. Like, a lot. Ella Lopez: Was it because of Pierce? Chloe Decker: No. No. I... I don't think any of this is really about Pierce. I think if I'm honest with myself... all of this is about Lucifer. Lucifer's the... the reason that I said yes to Pierce, and... he's also the reason that I said no. 18.8.2018 All of this is about Lucifer. Lucifer’s the reason. Marcus Pierce: Listen, let's forget about the whole "big event" thing, okay? Life is too short. Chloe Decker: Too short, yeah. Marcus Pierce: Yeah. Let's elope. We don't need the whole circus. It's about you and me. Chloe Decker: Yeah. And-and-and that's why I... I can't marry you. I'm sorry, Marcus. 18.8.2018 I can’t marry you. I’m sorry, Marcus. Mazikeen: Is that a wedding murder board? Chloe Decker: I am just trying to stay organized here. Mazikeen: Wow. Mug shot for the caterer. Nice work, Decker. Ella Lopez: You see what I'm dealing with? Chloe Decker: Guys, solving crimes makes sense to me. Wedding stuff, not so much. 18.8.2018 Is that a wedding murder board? Marcus Pierce: For days I've been thinking about how I screwed up. Tried to figure out how to make things better. When you find that person who gives life meaning, Chloe, nothing else matters. Marcus Pierce: I know you don't trust me. I know I've made mistakes. I've made an eternity's worth of mistakes. But please, let me spend the rest of my days making it up to you. Chloe Decker: What? What are you doing? Marcus Pierce: Chloe Decker, will you marry me? 18.8.2018 Chloe Decker, will you marry me? Linda Martin: You're doing the same thing as Him now. By not telling Chloe the truth, you're taking her choice away. Lucifer Morningstar: No. No. No, it's different. Linda Martin: You know, the truth is... no one really knows what your dad's responsible for. We're all just guessing. Even you. But you know the one thing He can't control? What you do in this moment right now. So I ask you, the Devil... what do you truly desire? Lucifer Morningstar: I want her to choose me. Linda Martin: Then tell her. 18.8.2018 I ask you, the Devil… what do you truly desire? Lucifer Morningstar (to a criminal): To think... you could've had everything you wanted. All you needed to do was tell Amber how you felt, but you blew it. And so did I. 18.8.2018 You blew it. And so did I.
Chloe Decker: You got me a car? Chloe Decker: Wait, do you think this is some sort of competition? Lucifer Morningstar: Of course. If it isn't painfully obvious, anything Pierce can do, I can do better. Chloe Decker: It's not about stuff, Lucifer. Thanks anyhow. 18.8.2018 Anything Pierce can do, I can do better.